In lieu of a specific recipe today, I wanted to share with you my new favorite way to decorate cut-out cookies. Let me start by saying that I love fancifully decorated desserts. They are adorable and enviable and just plain awe-worthy. The problem is, I was born without the ability patience to decorate cookies and desserts in a detailed and fancy manner. Am I obsessed with Bakerella’s cake pops? Absolutely! That woman is a wizard when it comes to miniature sugar sculptures. What she can do with some candy coating and a handful of toothpicks completely blows my mind. Amazing. The problem is, I just can’t do it. I don’t know if it’s lack of skill or patience or frankly a bit of both, but it’s beyond me. As a result, it just makes me appreciate her intricate confections even more. The same can be said when it comes to cut-out cookies. I am totally enamored with Bridget’s work at Bake at 350. Her cookies just simply make me smile. They are incredibly clever and perfect and her site is full of happiness. And really, isn’t that what cookies are all about? Bringing joy and happiness? For our cut-out cookies this year I wanted that happiness. Not a big old mess of frustration in the kitchen. I heard about food writer pens (not totally sure from where, but it’s a safe bet that it was from Pinterest) and thought they would work great on cut out cookies and ease my stress of decorating cookies. A quick Google search showed me that I was indeed not the first person to have this idea, but it also came back with some great ideas and tips on how to use them with success. My favorite tips came from Bridget at Bake at 350. 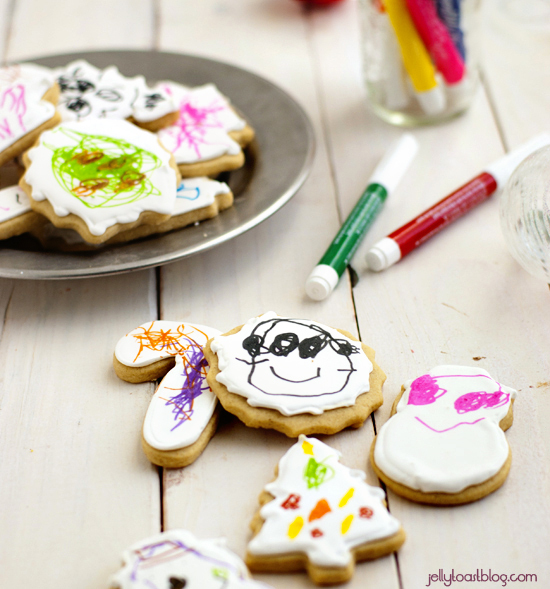 I used her tips to help my kiddos create some cookies for my husband for his birthday last month (see above) and thought the same method would make some pretty adorable Christmas cookies, as well (see below). So that’s what we did this year. 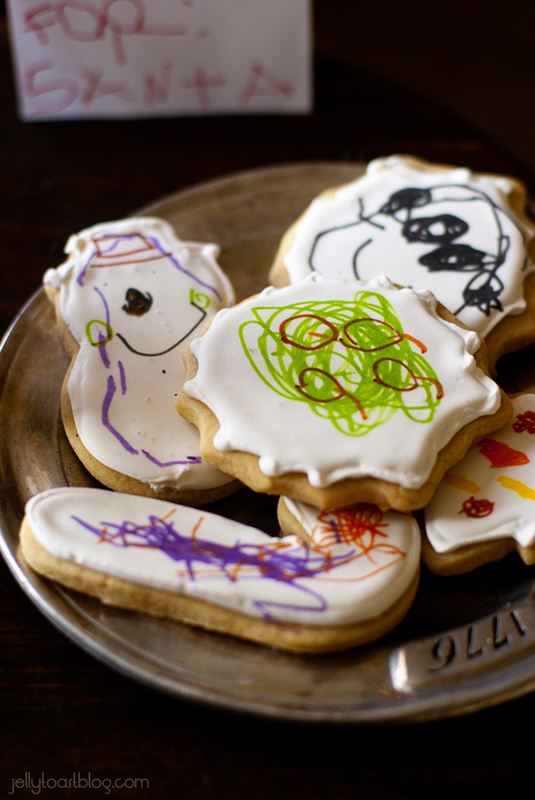 We made the cookies together, I iced them, and the kiddos decorated them. No stress. 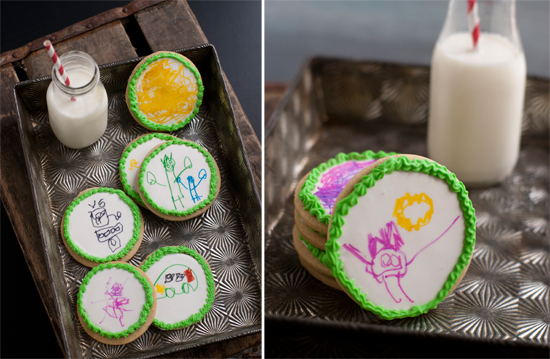 Plus, I am such a sucker for little people drawings that to me, these are the most beautiful cookies I’ve ever seen. Or eaten. There’s a slight chance I might be biased. 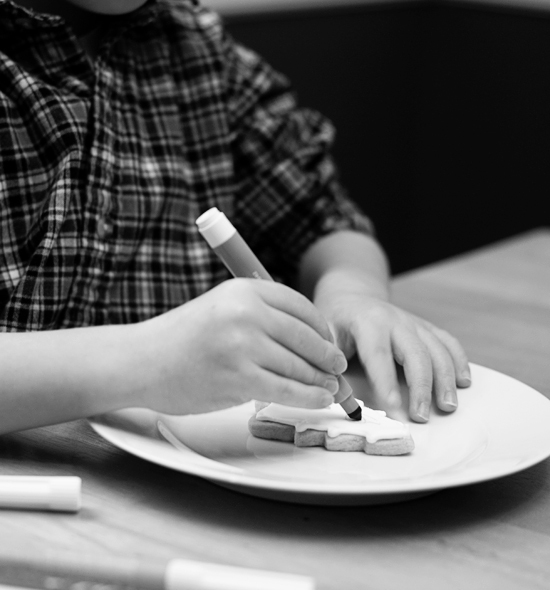 If you’re looking for something fun to do over your holiday break, I would suggest whipping up a batch of these food writer cut-out cookies and letting your kids go to town with these food writer pens. I used Bridget’s Brown Sugar and Spice Cookies and her Royal Icing and they were perfection. Just don’t look too closely at my icing skills, as I have none and I’m totally okay with it. The sweet little drawings cover up my wiggly icing. I hope all of you have a wonderful and safe Christmas and holiday season! 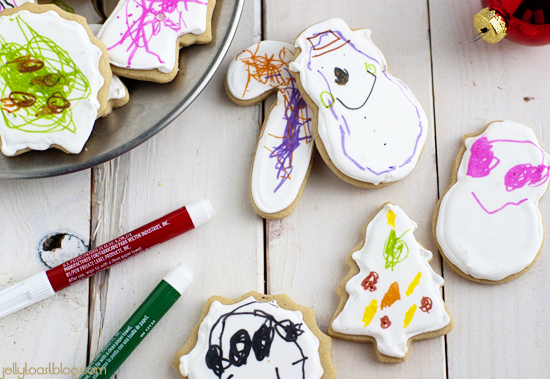 This is such a fun and creative way of decorating cookies!! 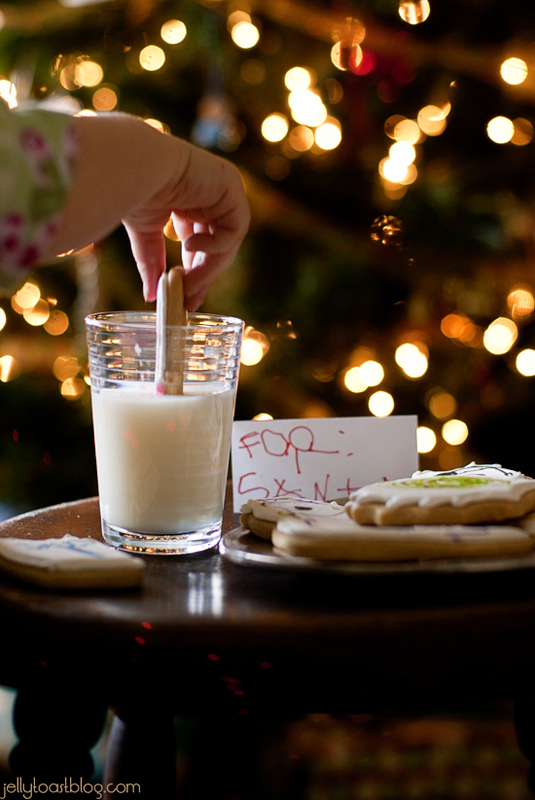 My nieces and nephews made several batches of holiday cookies this year and I know they would have LOVED to write on some sugar cookies! I’ll save this idea for their birthdays and upcoming holidays! Thanks for a genius, crafty treat! Thanks, Julia! 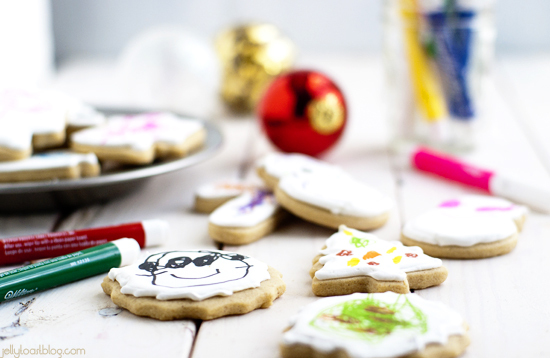 My kids just love seeing their drawings in cookies and the fact that it gets me off the hook for intricate decorating – so it’s a total win win in my book! Thanks for stopping by and saying hi! Have a Happy New Year! Thanks so much, Jessica! 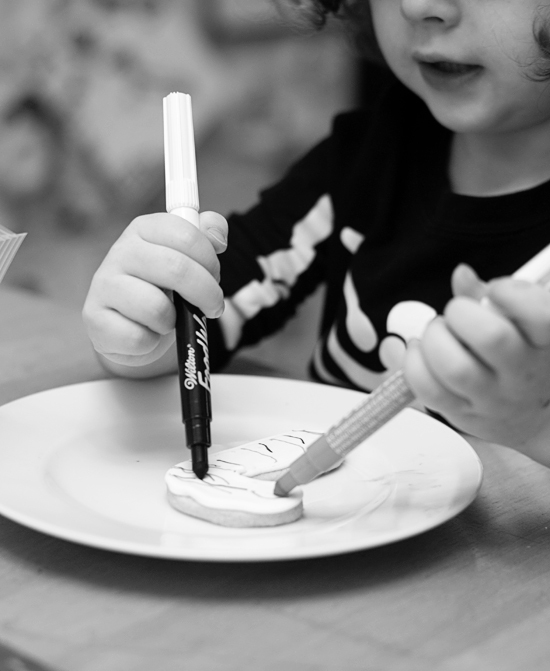 I end up loving them so much after they’re done drawing on them, it makes it a little difficult to actually bring myself to eat them. I just take a bunch of pictures so I can see their artwork again 🙂 Thanks for taking the time to comment!